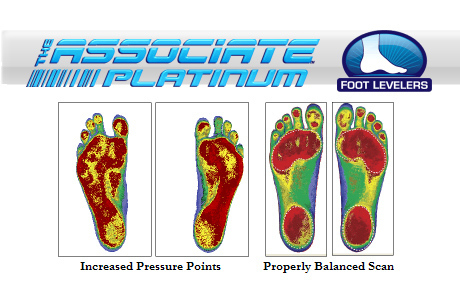 The increased reddened areas in the above scan on the left visually demonstrate increased pressure points and stress on the human foot due to a lack of properly maintained arches. Your feet are the foundation of your body. They support you when you stand, walk, or run. Just like in the building of a new home, you must start with a stable foundation in order to obtain a sturdy home. Many times, the pain you feel in one place is a result of imbalance in another. The pain in your neck could be caused by a misalignment in your spine, which is a result of an uneven pelvis that is caused by unbalanced positioning in your feet. See? It’s a chain reaction. By stabilizing and balancing your feet, your body performs efficiently, pain is reduced and this contributes to your total body wellness. 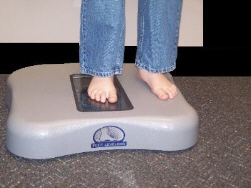 One of the ways we stabilize the feet are using orthotics. 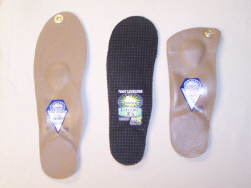 These orthotics are custom made to your foot according to a pressure scan we do in our office. You can see right away if your feet are putting pressure on the right spots or if there is an imbalance.